^ Sawyer, P. H. (2013-04-15). 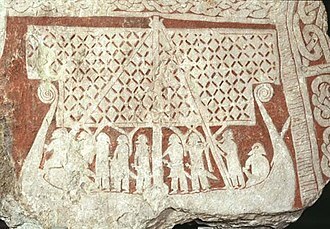 Kings and Vikings: Scandinavia and Europe AD 700–1100. Routledge. ISBN 9781134947775. ^ Haine, Thomas (2008-03-01). 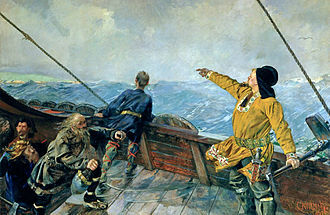 "What did the Viking discoverers of America know of the North Atlantic Environment?". Weather. 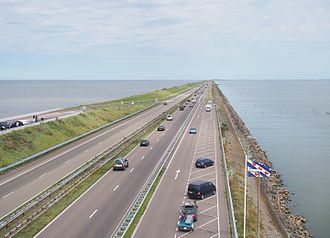 63 (3): 60–65. Bibcode:2008Wthr...63...60H. doi:10.1002/wea.150. ISSN 1477-8696. ^ Näsman, Ulf (2000-11-01). 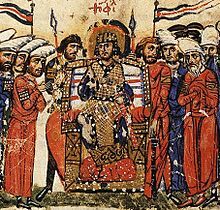 "Raids, Migrations, and Kingdoms". 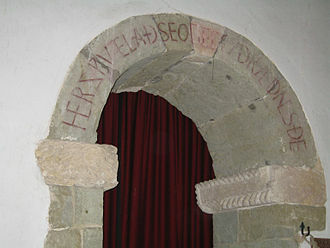 Acta Archaeologica. 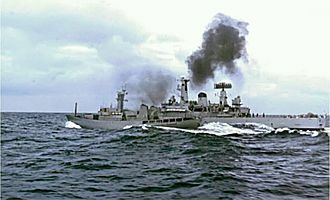 71 (1): 1–7. doi:10.1034/j.1600-0390.2000.d01-1.x. ISSN 1600-0390. ^ Macauley Richardson, Lloyd. "Books: Eurasian Exploration". Policy Review. Hoover Institution. Archived from the original on 2009-12-16. ^ Fondén, R; Leporanta, K; Svensson, U (2007). "Chapter 7. Nordic/Scandinavian Fermented Milk Products". In Tamime, Adnan. Fermented Milks. Blackwell. doi:10.1002/9780470995501.ch7. ISBN 978-0632064588. ^ Bo Ejstrud et.al. (2011). From Flax To Linen – experiments with flax at Ribe Viking Centre (PDF). University of Southern Denmark. ISBN 978-87-992214-6-2. Retrieved 19 April 2015. ^ "Scans of Viking Swords Reveal a Slice of Norse Culture". Live Science. Retrieved 2017-04-15. ^ Fedrigo, Anna; Grazzi, Francesco; Williams, Alan R.; Panzner, Tobias; Lefmann, Kim; Lindelof, Poul Erik; Jørgensen, Lars; Pentz, Peter; Scherillo, Antonella (2017-04-01). 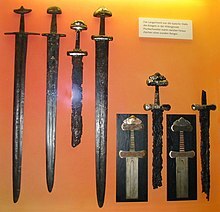 "Extraction of archaeological information from metallic artefacts—A neutron diffraction study on Viking swords". Journal of Archaeological Science: Reports. 12: 425–36. doi:10.1016/j.jasrep.2017.02.014. Brink, Stefan (2008). "Who were the Vikings?". In Brink, Stefan; Price, Neil. The Viking World. Routledge. pp. 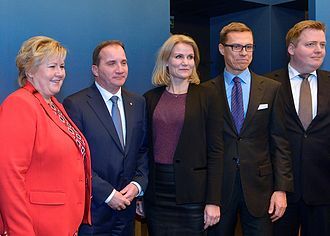 4–10. ISBN 978-0415692625. Lindqvist, Thomas (4 September 2003). "Early Political Organisation: (a) An Introductory Survey". In Helle, Knut. 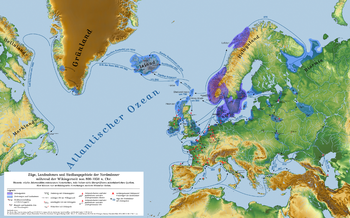 The Cambridge History of Scandinavia: Prehistory to 1520. Cambridge University Press. pp. 160–67. ISBN 978-0521472999. Williams, Gareth (2007). "Kingship, Christianity and coinage: monetary and political perspectives on silver economy in the Viking Age". In Graham-Campbell, James; Williams, Gareth. 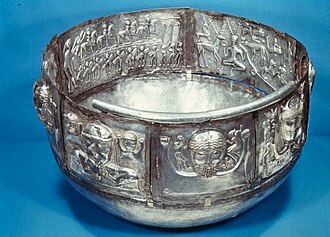 Silver Economy in the Viking Age. Left Coast Press. pp. 177–214. ISBN 978-1598742220. Wamers, Egon (1998). "Insular Finds in Viking Age Scandinavia and the State Formation of Norway". In Clarke, H.B. ; Mhaonaigh, M. Ní; Floinn, R. Ó. Ireland and Scandinavia in the Early Viking Age. Dublin: Four Courts Press. pp. 37–72. ISBN 978-1851822355. Scandinavian Airlines, often shortened to SAS is the flag carrier of Sweden and Denmark, and the largest airline in Scandinavia. Part of the SAS Group and headquartered at the SAS Frösundavik Office Building in Solna, the airlines main hub is at Copenhagen-Kastrup Airport, with connections to over 50 cities in Europe. Stockholm-Arlanda Airport and Oslo Airport, Gardermoen are the major hubs. Minor hubs exist at Bergen Airport, Flesland, Göteborg Landvetter Airport, Stavanger Airport and Trondheim Airport, SAS Cargo is an independent, wholly owned subsidiary of Scandinavian Airlines and its main office is at Copenhagen Airport. In 2012, SAS carried 25.9 million passengers, achieving revenues of SEK36 billion and this makes it the eighth-largest airline in Europe. The SAS fleet consists of Airbus A319, A320, A321, A330 and A340, Boeing 737 Next Generation, in addition, SAS wetleases ATR72, Saab 2000 and Bombardier CRJ900 aircraft. The airline was founded in 1946 as a consortium to pool the operations of Svensk Interkontinental Lufttrafik, Det Norske Luftfartselskap. The consortium was extended to cover European and domestic cooperation two years later, in 1951, all the airlines were merged to create SAS. SAS is one of the members of the worlds largest alliance. Operations started on 17 September 1946, in 1948 the Swedish flag carrier AB Aerotransport joined SAS and the companies coordinated European operations and finally merged to form the SAS Consortium in 1951. When established, the airline was divided between SAS Danmark, SAS Norge and SAS Sverige, all owned 50% by private investors, in 1954 SAS was the first airline to start scheduled flights on a polar route. The DC-6B flew from Copenhagen to Los Angeles, United States with stops in Søndre Strømfjord, Greenland, by summer 1956 frequency had increased to three flights per week. It was popular with Hollywood celebrities and film people. Thanks to a structure that allowed free transit to other European destinations via Copenhagen. In 1957 SAS started a second polar route when a DC-7C flew from Copenhagen to Tokyo, Japan, SAS publicized this service as round-the-world service over the North Pole. The history of Norway has been influenced to an extraordinary degree by the terrain and the climate of the region. 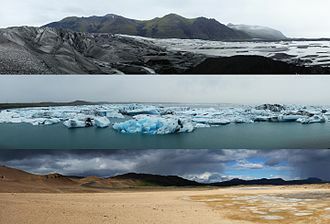 About 10,000 BC, following the retreat of the inland ice sheets. They traveled steadily northwards along the areas, warmed by the Gulf Stream. 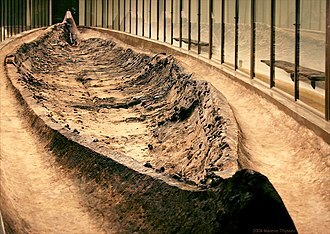 In order to survive they fished and hunted reindeer, between 5,000 BC and 4,000 BC the earliest agricultural settlements appeared around the Oslofjord. Gradually, between 1500 BC and 500 BC, these agricultural settlements spread into the areas of Norway - whilst the inhabitants of the northern regions continued to hunt. 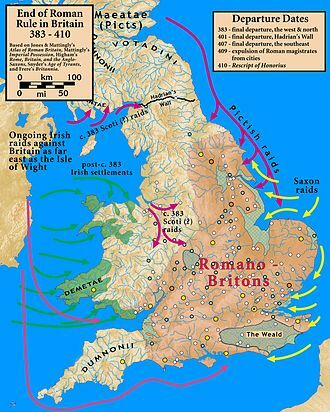 The Neolithic period started 4000 BC, the Migration Period caused the first chieftains to take control and the first defenses to be made. 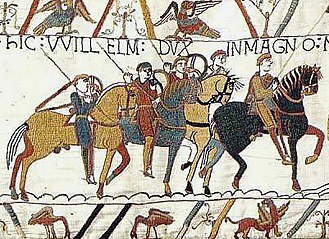 From the last decades of the 8th century Norwegians started expanding across the seas to the British Isles, the Viking Age saw the unification of the country. Christianization took place during the 11th century and Nidaros became an archdiocese, the population expanded quickly until 1349 when it was halved by the Black Death and successive plagues. 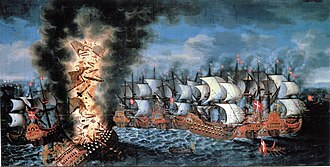 Bergen became the trading port, controlled by the Hanseatic League. Norway entered the Kalmar Union with Denmark and Sweden in 1397, after Sweden left the union in 1523, Norway became the junior partner in Denmark–Norway. The Reformation was introduced in 1537 and absolute monarchy imposed in 1661, in 1814 Norway was ceded to the king of Sweden by the Treaty of Kiel. 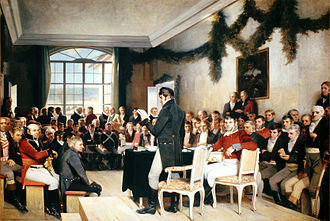 Norway declared its independence and adopted a a constitution, however, no foreign powers recognized the Norwegian independence but supported the Swedish demand for Norway to comply with the treaty of Kiel. The union was established after the extraordinary Storting adopted the necessary amendments to the Constitution. Industrialization started in the 1840s and from the 1860s large-scale emigration to North America took place, in 1884 the king appointed Johan Sverdrup as prime minister, thus establishing parliamentarism. The union with Sweden was dissolved in 1905, from the 1880s to the 1920s, Norwegians such as Roald Amundsen and Fridtjof Nansen carried out a series of important polar expeditions. Trade, or commerce, involves the transfer of goods or services from one person or entity to another, often in exchange for money. A network that allows trade is called a market, the original form of trade, saw the direct exchange of goods and services for other goods and services. 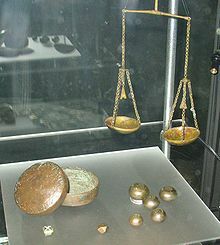 Barter is trading things without the use of money, one side of the barter started to involve precious metals, which gained symbolic as well as practical importance. Modern traders generally negotiate through a medium of exchange, such as money, as a result, buying can be separated from selling, or earning. The invention of money greatly simplified and promoted trade, Trade between two traders is called bilateral trade, while trade between more than two traders is called multilateral trade. Trade exists due to the specialization and division of labor, in which most people concentrate on an aspect of production. As such, trade at prices between locations can benefit both locations. Trade originated with human communication in prehistoric times, trading was the main facility of prehistoric people, who bartered goods and services from each other before the innovation of modern-day currency. Peter Watson dates the history of commerce from circa 150,000 years ago. In the Mediterranean region the earliest contact between cultures were of members of the species Homo sapiens principally using the Danube river, at a time beginning 35–30,000 BCE, Trade is believed to have taken place throughout much of recorded human history. There is evidence of the exchange of obsidian and flint during the stone age, Trade in obsidian is believed to have taken place in Guinea from 17,000 BCE. The earliest use of obsidian in the Near East dates to the Lower, Trade in the stone age was investigated by Robert Carr Bosanquet in excavations of 1901. Trade is believed to have first begun in south west Asia, obsidian was traded at distances of 900 kilometres within the Mediterranean region. Trade in the Mediterranean during the Neolithic of Europe was greatest in this material, networks were in existence at around 12,000 BCE Anatolia was the source primarily for trade with the Levant and Egypt according to Zarins study of 1990. 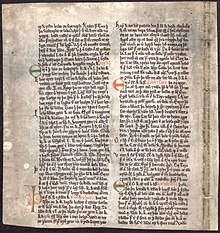 The history of Denmark as a unified kingdom began in the 8th century, but historic documents describe the geographic area and the people living there - the Danes -, as early as 500 AD. 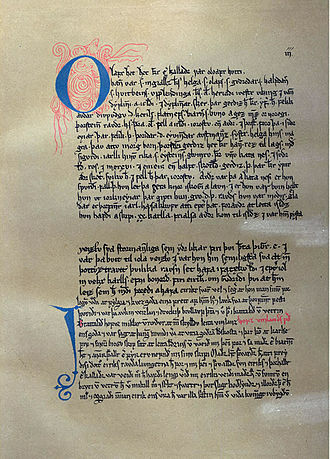 These early documents include the writings of Jordanes and Procopius, with the Christianization of the Danes c.960 AD, it is clear that there existed a kingship in Scandinavia, controlling the current Danish territory roughly speaking. Queen Margrethe II can trace her back to the Viking kings Gorm the Old and Harald Bluetooth from this time. The area we now know as Denmark, has a rich prehistory, having been populated by prehistoric cultures and people for about 12,000 years. 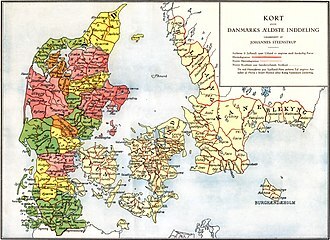 Denmark was long in disputes with Sweden over control of Skånelandene and with Germany over control of Schleswig, Denmark lost these conflicts and ended up ceding first Skåneland to Sweden and Schleswig-Holstein to the German Empire. 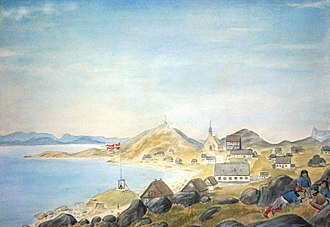 After the eventual cession of Norway in 1814, Denmark retained control of the old Norwegian colonies of the Faroe Islands and Iceland. 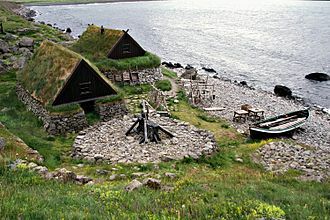 During the 20th century, Iceland gained independence and the Faroese became integral parts of the Kingdom of Denmark and North Schleswig reunited with Denmark in 1920 after a referendum. 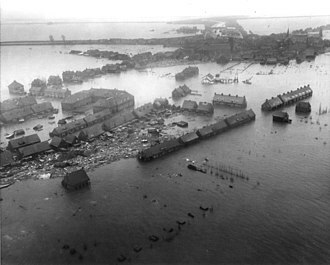 During World War II, Denmark was occupied by Nazi Germany, in the aftermaths of World War II, and with the emergence of the subsequent Cold War, Denmark was quick to join the military alliance of NATO as a founding member in 1949. 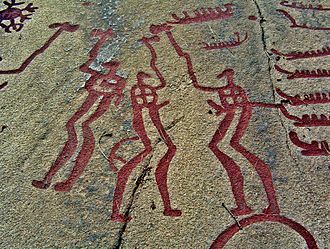 The Scandinavian region has a rich prehistory, having been populated by prehistoric cultures and people for about 12,000 years. 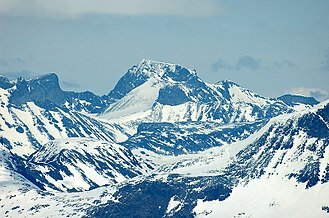 During the ice age, all of Scandinavia was covered by glaciers most of the time, when the ice began retreating, the barren tundras were soon inhabited by reindeer and elk and Ahrenburg and Swiderian hunters from the south followed them here to hunt occasionally. 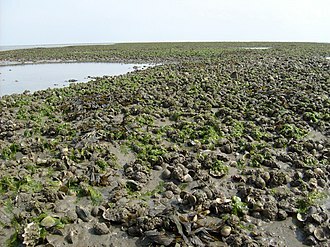 The geography was very different from what we know today, as the climate warmed up, forceful rivers of meltwater started to flow and shape the virgin lands, and a more stable flora and fauna gradually began emerging in Scandinavia and Denmark in particular. 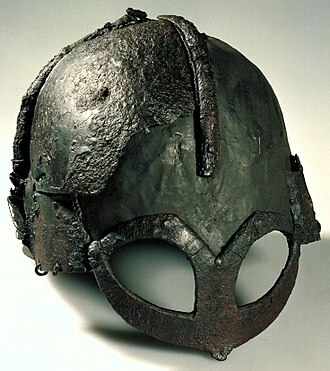 Iron Age Scandinavia refers to the Iron Age, as it unfolded in Scandinavia. 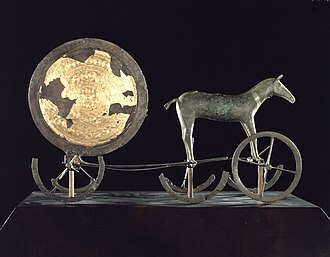 The 6th and 5th century BC was a point for exports and imports on the European continent. 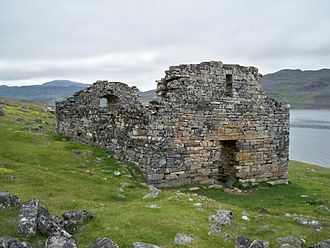 Now they had to be practically self-dependent and self-sustaining, archaeology attests a rapid and deep change in the Scandinavian culture and way of life. Agricultural production became more intensified, organized around larger settlements and with a much more labour-intensive production, slaves were introduced and deployed, something uncommon in the Nordic Bronze Age. 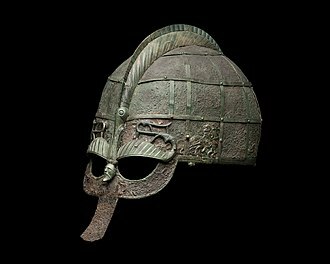 Bronze could not be produced in Scandinavia, as tin was not a natural resource. Iron is a metal and was suitable for tools and weapons. 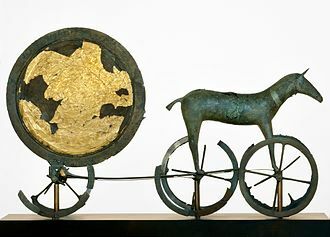 The Bronze Age ard plough was still the plough of choice, herds of livestock had pasture grazed freely in large wood pastures, but were now placed in stables, probably to utilize manure more efficiently and increase agricultural production. Even though the advent of the Iron Age in Scandinavia was a time of great crisis, the period might just reflect a change of culture and not necessarily a decline in standards of living. 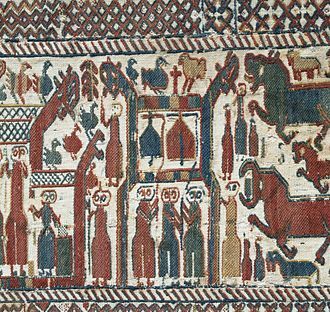 Viking art has many design elements in common with Celtic, the Romanesque and Eastern European art, sharing many influences with each of these traditions. 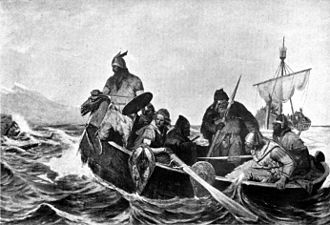 The alternative name for the Viking people, Norse or Norsemen, Viking raiders attacked wealthy targets on the north-western coasts of Europe from the late 8th until the mid-11th century CE. 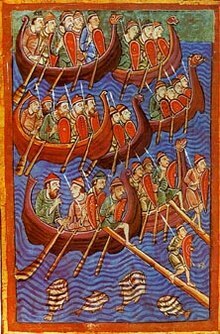 Pre-Christian traders and sea raiders, the Vikings first enter recorded history with their attack on the Christian monastic community on Lindisfarne Island in 793, the Vikings initially employed their longships to invade and attack European coasts and river settlements on a seasonal basis. 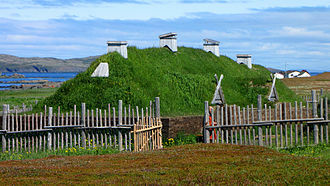 Evidence exists for Vikings reaching Newfoundland well before the voyages of Christopher Columbus discovered the New World. 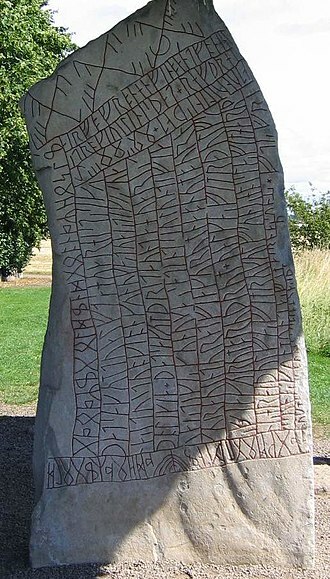 Trading and merchant activities were accompanied by settlement and colonisation in many of these territories, importantly, it was the English archaeologist David M. Together these scholars have combined authority with accessibility to promote the understanding of Viking art as a cultural expression. The artistic record therefore, as it has survived to the present day, ongoing archaeological excavation and opportunistic finds, of course, may improve this situation in the future, as indeed they have in the recent past. Wood was undoubtedly the primary material of choice for Viking artists, being easy to carve, inexpensive. The same is true of the textile arts, although weaving. Subsequently, and likely influenced by the spread of Christianity, the use of carved stone for permanent memorials became more prevalent, jewellery was worn by both men and women, though of different types. Married women fastened their overdresses near the shoulder with matching pairs of large brooches, modern scholars often call them tortoise brooches because of their domed shape. The shapes and styles of womens paired brooches varied regionally, women often strung metal chains or strings of beads between the brooches, or suspended ornaments from the bottom of the brooches. 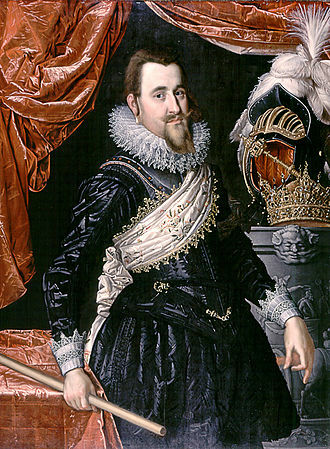 Men wore rings on their fingers and necks, and held their cloaks closed with penannular brooches and their weapons were often richly decorated on areas such as sword hilts. 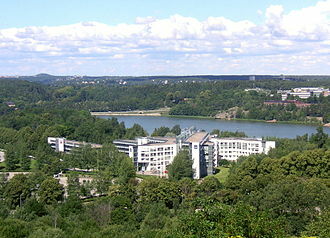 The history of Estonia forms a part of the history of Europe. Humans settled in the region of Estonia near the end of the last glacial era, before German crusaders invaded in the early 13th century, proto-Estonians of ancient Estonia worshipped spirits of nature. From 1418 to 1562 the whole of Estonia formed part of the Livonian Confederation, after the Livonian War of 1558-1583, Estonia became part of the Swedish Empire until 1710/1721, when Sweden ceded it to Russia as a result of the Great Northern War of 1700-1721. Throughout this period the Baltic-German nobility enjoyed autonomy, and German served as the language of administration and education, the Estophile Enlightenment Period led to the Estonian national awakening in the middle of the 19th century. In the aftermath of World War I and the Russian revolutions of 1917, the Estonian War of Independence ensued on two fronts, the newly proclaimed state fought against Bolshevist Russia to the east and against the Baltic German forces to the south. The Tartu Peace Treaty marked the end of fighting and recognised Estonian independence in perpetuity, in 1940, in the wake of the Molotov–Ribbentrop Pact of 1939, the Soviet Union occupied Estonia and illegally annexed the country. In the course of Operation Barbarossa, Nazi Germany occupied Estonia in 1941, Estonia regained independence in 1991 in the course of the collapse of the USSR and joined the European Union and NATO in 2004. The region has been populated since the end of the Late Pleistocene Ice Age, the earliest traces of human settlement in Estonia are connected with the Kunda culture. The early mesolithic Pulli settlement is located by the Pärnu River and it has been dated to the beginning of the 9th millennium BC. 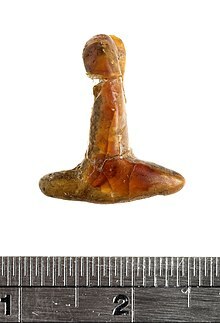 The Kunda culture received its name from the Lammasmäe settlement site in northern Estonia and stone artifacts similar to those found at Kunda have been discovered elsewhere in Estonia, as well as in Latvia, northern Lithuania and southern Finland. Among minerals and quartz were used the most for making cutting tools, the beginning of the Neolithic Period is marked by the ceramics of the Narva culture, and appear in Estonia at the beginning of the 5th millennium. The oldest finds date from around 4900 BC, the first pottery was made of thick clay mixed with pebbles, shells or plants. The Narva-type ceramics are found throughout almost the entire Estonian coastal region and on the islands, the stone and bone tools of the era have a notable similarity with the artifacts of the Kunda culture. Around the beginning of 4th millennium BC Comb Ceramic culture arrived in Estonia, until the early 1980s the arrival of Finnic peoples, the ancestors of the Estonians and Livonians, on the shores of the Baltic Sea was associated with the Comb Ceramic Culture. Some researchers have argued that a Uralic form of language may have been spoken in Estonia. The burial customs of the comb pottery people included additions of figures of animals, birds and men carved from bone, antiquities from comb pottery culture are found from Northern Finland to Eastern Prussia. The beginning of the Late Neolithic Period about 2200 BC is characterized by the appearance of the Corded Ware culture, pottery with corded decoration, evidence of agriculture is provided by charred grains of wheat on the wall of a corded-ware vessel found in Iru settlement. The San Juan de Dios Market in Guadalajara, Jalisco. Ancient Etruscan "aryballoi" terracota vessels unearthed in the 1860s at Bolzhaya Bliznitsa tumulus near Phanagoria, South Russia (then part of the Bosporan Kingdom of Cimmerian Bosporus); on exhibit at the Hermitage Museum in Saint Petersburg. Tajadero or axe money used as currency in Mesoamerica. It had a fixed worth of 8,000 cacao seeds, which were also used as currency. 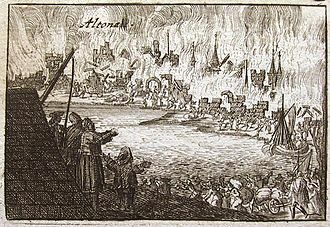 Danzig in the 17th century, a port of the Hanseatic League. 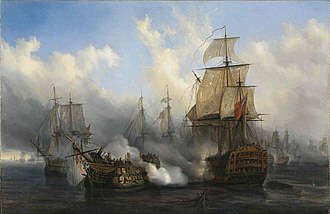 The British HMS Sandwich fires to the French flagship Bucentaure (completely dismasted) into battle off Trafalgar. 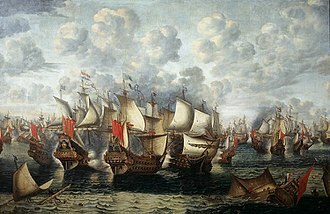 The Bucentaure also fights HMS Victory (behind her) and HMS Temeraire (left side of the picture). In fact, HMS Sandwich never fought at Trafalgar, it is a mistake from Auguste Mayer, the painter. Ivar Aasen (drawing by Olav Rusti). 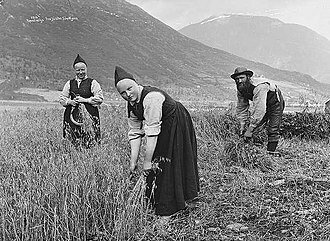 The Norwegian romantic nationalism movement sought to identify and celebrate the genuinely Norwegian.